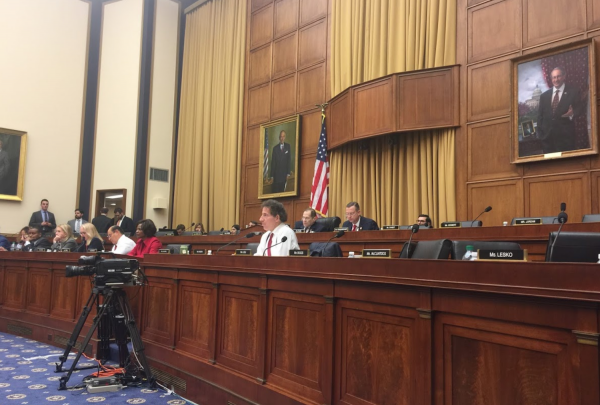 Rep. Jamie Raskin, D-Md., asks a witness a question as Democratic members of the House Judiciary Committee look on. Most Republican members left the hearing after the lunch recess. 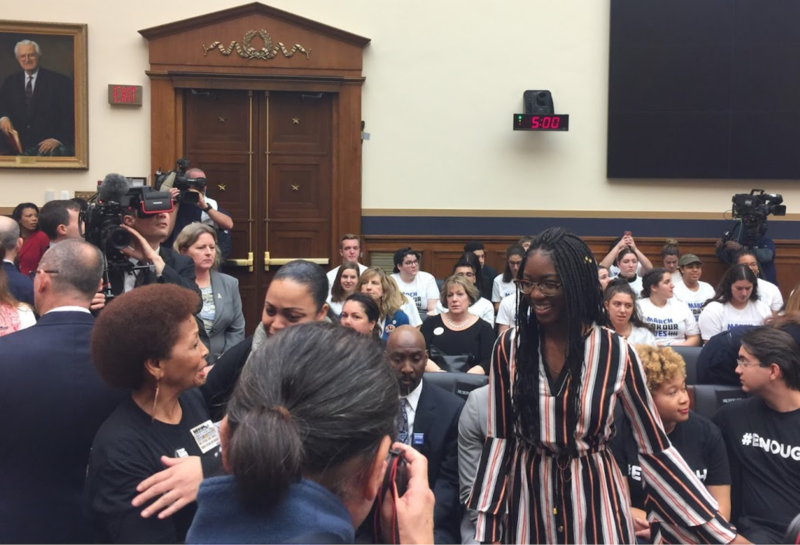 At the first hearing on gun violence on Capitol Hill since 2011, politicians fell into well-worn party roles, but — as they have for much of the last year — young people brought new energy to the familiar debate. A week before the one-year anniversary of the shooting at Marjory Stoneman Douglas High School in Parkland, Florida, the House Judiciary Committee gathered Wednesday to discuss a universal gun background check bill, known as HR8, introduced by House Democrats. HR8 would require background checks for every firearm sale, including at guns shows and online. This would update current law, which requires background checks only when purchasing a gun at licensed firearm dealers like gun shops. 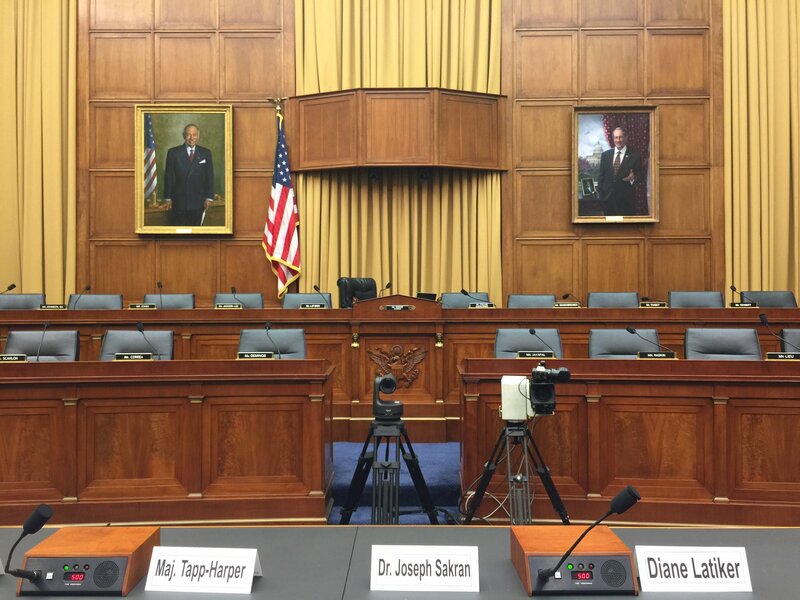 The House Judiciary Committee hearing room on Wednesday morning before proceedings began. Placards are set for the eight witnesses invited to testify; six invited by Democratic members and two by Republicans. The gallery was filled to capacity with enthusiastic young people wearing “March For Our Lives” T-shirts, as well as survivors and relatives of victims from Marjory Stoneman Douglas, the 1999 Columbine High School shooting and the shooting at The Capital Gazette, in Annapolis, Maryland, last year. Students from Georgetown University who came to watch the hearing. They are members of the D.C. Chapter of March for Our Lives. Throughout the day, lawmakers asked the panel questions and parried with each other over how best to address the problem of gun deaths in America. Democrats on the committee stressed the need to address what they called “loopholes” in federal law that allow persons who shouldn’t own guns to purchase them without a background check. Louisiana Rep. Cedric Richmond raised the example of the Charleston church shooter, whose background check was delayed for several days but whose gun purchase was allowed to “default proceed” because the National Instant Criminal Background Check System couldn’t determine fast enough whether he had been charged with a felony for drug possession, though he had been. Panelist Robyn Thomas from Giffords Law Center confirmed that the proposed HR8 bill would not allow a gun sale until a background check is fully completed. Republican lawmakers raised concerns again and again over the impact of HR8 on gun owners and their Second Amendment rights. Some argued the law would make it too expensive and too onerous to buy guns and warned it would “criminalize” the right of gun buyers to give guns to family members and friends. They also expressed fears that the law would create a “national registry” of gun owners, even though one panelist pointed out this is expressly prohibited in Section 5 of the text of the bill. And Rep. Kelly Armstrong, a Republican representative from North Dakota worried about the impact on rural gun owners: “We are creating felons out of every ranch and farm kid out in North Dakota and the entire Midwest population,” Armstrong said, implying that the common practice of loaning or gifting guns would be made illegal. As written, HR8 includes an exception for gifting or loaning guns to family. Rep. Mike Thompson (D-Calif.), who introduced HR8, told young people gathered in the gallery he hoped the hearing could “bring some intelligence” to the issue. 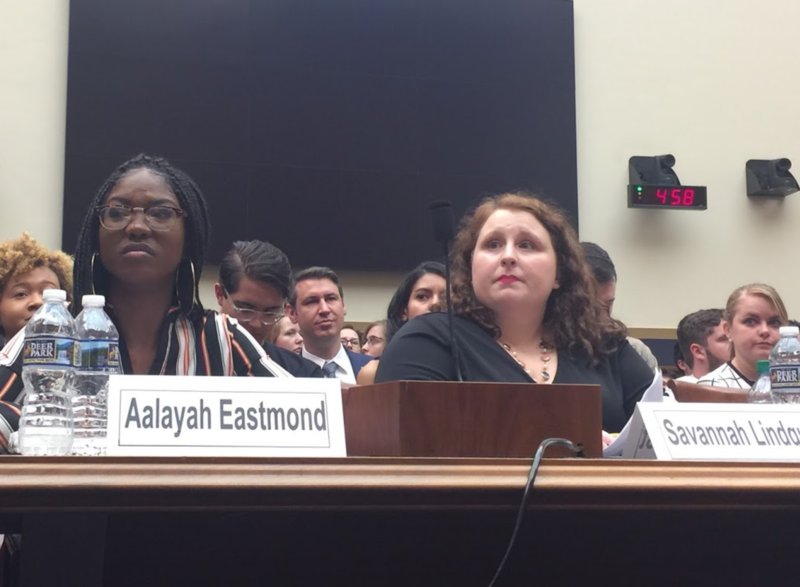 Marjory Stoneman Douglas High School senior Aalayah Eastmond testified about her experience hiding under the body of a deceased classmate while the Parkland shooter stalked her classroom. She pleaded with the committee to pass HR8, saying it “makes absolutely no sense” that someone can go online or to a gun show and purchase a gun without a background check. Read Eastmond’s full testimony here. Marjory Stoneman Douglas senior Aalayah Eastmond and gun rights activist Savannah Lindquist answer questions about their experiences as victims. Eastmond survived the Parkland mass shooting and Lindquist survived sexual assault while in college. The committee also heard from gun rights activist and sexual assault survivor Savannah Lindquist. 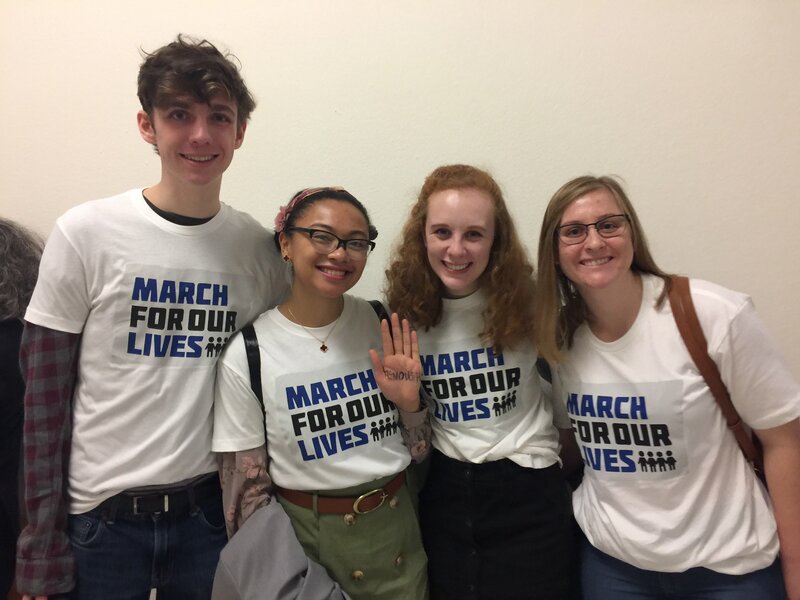 “Because of so-called common-sense gun laws [that barred Lindquist from carrying a gun on campus], I was left defenseless that night,” Lindquist told the committee. Watch Lindquist’s full testimony here on C-SPAN. Republicans repeatedly argued that expanding background checks would not prevent gun violence, saying most criminals get their guns illegally anyway. Republicans offered in support of this a recent study from the Bureau of Justice Statistics. But research also shows that the vast majority (more than 70 percent) of mass shooters since 1982 obtained their guns legally. While polls continue to show bipartisan support for universal background checks, research is mixed about whether background checks actually prevent gun violence. For example, a 2017 RAND Corporation concluded that background checks have “moderate” effects on reducing suicide and gun crime. And a recent joint study from the UC Davis Violence Prevention Research Program and Johns Hopkins University found that California’s universal background check had no effect on the number of gun homicides or suicides in that state. The Trace has an explainer on the research on universal background checks. Lawmakers and panelists touched on a myriad of gun violence problems, including firearm suicides, urban homicides, mass shootings and accidental deaths. Dr. Joseph Sakran, a trauma surgeon at Johns Hopkins Medicine who is also a gunshot survivor and launched @ThisIsOurLane, testified that gun violence in America is a “multi-faceted health problem” and warned that if nothing is done about it, “1 million Americans will be shot in the next decade.” Dr. Sakran also noted that the majority of gun deaths in the U.S. are suicides. 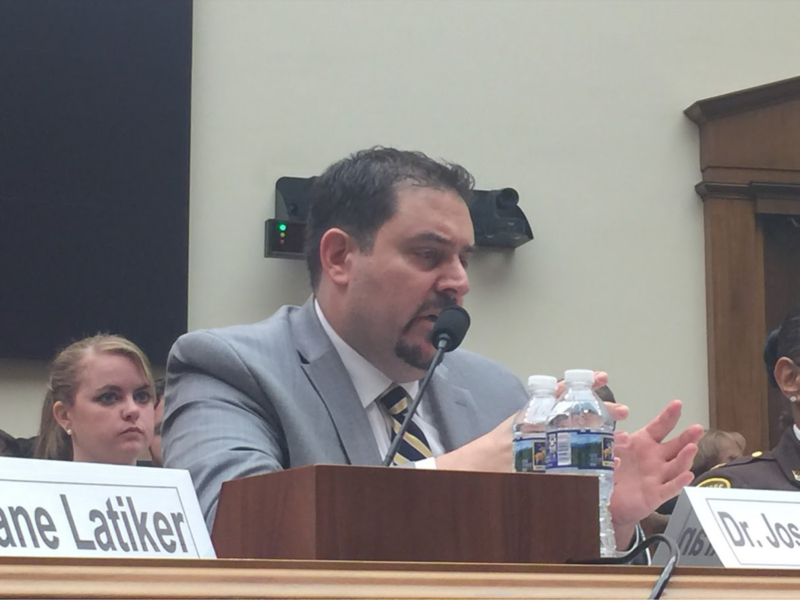 Dr. Joseph Sakran of Johns Hopkins School of Medicine answers a question from members of the House Judiciary Committee. Sakran was shot in the neck as a teenager but his life was saved by trauma surgeons, which he said motivated him to pursue a career in medicine. Democrats argued that while universal background checks for gun purchases might not solve all the problems related to gun violence, they are at least an important first step. Many Republicans on the committee said that they, too, were disturbed by mass shootings and gun deaths, but suggested that new gun laws are not the answer. It seems this basic disagreement has not changed in eight years. But what did feel different was the enthusiasm and energy coming from the young people present in the room, many of whom had lined up since 7 a.m. to get a seat in the gallery. Parkland, Florida, mass shooting survivor Aalayah Eastmond looks on as other parents and community members embrace. Eastmond is a senior at Marjory Stoneman Douglas High School and hopes to attend Howard University in Washington, D.C.